FITS ON A STANDARD DYER PLUG ! The Liberty~Belle kiln meets the needs of serious hobbyists, potters and others who need a simple small automatic kiln ideal for home use or for a studio test kiln. 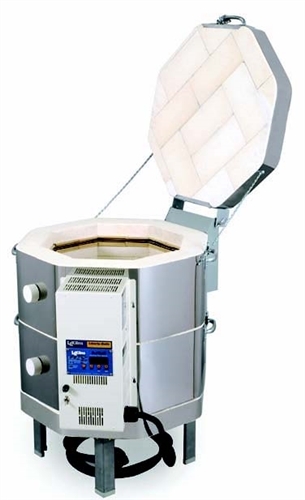 Complete easy-to-follow visual instructions make this kiln ideal for the beginner yet powerful enough for experienced users. It has L&L's time-proven technology like ceramic element holders, industrial-grade element terminals, heavy-duty elements and corrosion resistant materials. Insulation is an energy saving 3'' brick. This sectional kiln is easy to move and set up by the home user. The 12 foot long 30 amp cord makes it easy to plug in. (One full 15" shelf, four half 15" shelves, four each 1", 2", 4" and 6" triangular posts and one pound of cone 10 kiln wash). ENERGY SAVINGS: The kiln when empty can reach Cone 10 in about 2 hours and use about 12.5 KWH (this would cost about $1.00 @ 8 cents per KWH. When fired with a heavy load of 55 pounds it took 23 KWH to go to Cone 6 on a Fast Glaze program - about $1.84). Control: Simple Three Button Automatic control with four programs. Three programs are set up for ceramic firing (slow bisque to cone 06, Slow Glaze to cone 05, Fast Glaze to cone 6 - all of which can be easily changed. One program is left for anything you want such as firing glass or metal. Programs stay in memory until changed. There are eight segments in each program and each segment has a ramp, hold and a soak. Shipping BY MOTOR FREIGHT: 220 pounds for kiln. Add 30 pounds for furniture kit. 36'' by 36'' by 30'' high. Shipping class 85. 3" brick is standard on the Liberty-Belle. 2 1/2" is available but 3" is recommended for energy efficiency. You will save the difference in cost pretty quickly by using less electricity to heat the kiln with the thicker bricks. the kiln was empty. The LB18-240 (with 2-1/2" brick) heated up to 2350 Deg F in 2-1/2 hours. No change in delivery for this option. The standard plug that comes with the kiln is a Nema 14-30P (4 prong, 30 amp). This plug can be easily altered by the customer (by changing an included prong) to be a 14-50P (4 prong, 50 amp) plug. This is already included for no extra charge. L&L Vent-Sure Kiln Vent System L&L Kilns Furniture Kit For L&L Liberty Belle Kiln W/ 3"